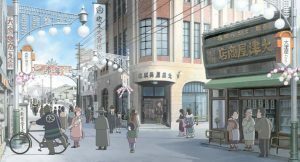 ‘In This Corner of the World’ JFF 2017 Review – Spotlight Report "The Best Entertainment Website in Oz"
Thanks to the Japan Foundation we had the chance to see the animated war drama In This Corner of the World (この世界の片隅に Kono Sekai no Katasumi ni) before its Japanese Film Festival debut. Directed by Sunao Katabuchi, the film is set during the times of World War II and follows the horrors of this dark period in history through the eyes of Suzy, an gentle girl from Hiroshima who loves writing. 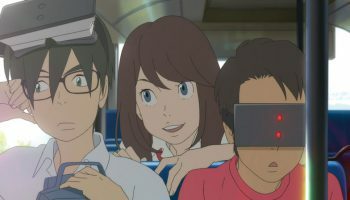 After getting married with a young guy who she barely knew, she moves to Kure, where she start helping her husband’s family with their daily duties, all while enjoying the view of the nearest port where all the big battleships, including the nightly Yamato dock. As the war progressed, Suzu must deal with the many air strikes in her new town, by hiding in bomb shelters and collecting rations of food. During this time, she endured many sad moments and even deal with a major injury after a bombing, something that only gets worse on the day of August 6, 1945 when the world she knew changed forever as the Atomic Bomb hit her motherland, Hiroshima. 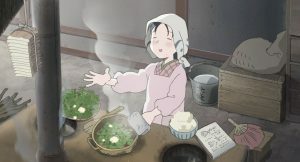 In This Corner of the World is a modern Japanese jewel who manages to offer viewers a ground-level perspective on one of History’s darkest periods, by using beautifully crafted animation and likeable naive characters whose angelic touch of innocence during hard times might move many to tears. The excellent – yet simple -art of the film recreates some of Hiroshima’s and Kure’s most iconic locations in such a gentle way that feels like if you are part of the story. What’s more, the way the director presents the moment of the Atomic Bomb is subtle, and even poetic, by not going into the crude reality of millions losing their life’s, but to giving a message of hope through a young survivor, who could be interpreted as a tribute to real-life survivor Sadako Sasaki, who was only 2 years old when the bomb was dropped and lived to tell the story until losing her battle with leukemia 10 years later. Overall, In This Corner of the World is a triumph, that proves once again why the simplest movies can be the most meaningful ones, and also remind us of events that should never happen again. Images © Fumiyo Kouno/Futabasha/Konosekai no katasumini Project . Via. JFF. 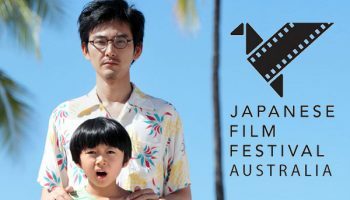 JFF 2017 Announces Full Program!